Its been a continuation of very difficult times for me of late, although I still feel that in some ways this years setup is a lot better than last years. my job as a driver for 50+ hours a week combined with the demands of our two toddlers, and increased living costs this year means I have little training time and money is a massive struggle each week. At the end of may my shoes, wallet, and hydration pak were stolen when i left my car unlocked. I unretired an old pair of shoes that I last used in September 2010, but they have holes in them and so collect small stones easily, and are pretty worn out. One running friend gave me a pair of minimalistic trail shoes, which are good on grass and trails, but not enough cushioning for road running as I quickly found out, although maybe if I changed my running style I could use them on road, but with the injuries Ive been carrying for 10 years maybe not. Another running friend gave me some second hand Nike Lunar range shoes that are in very good condition, and although I have had some blister issues, they are very fast shoes and probably the best shoes I've ever had, so a dream come true to get them. 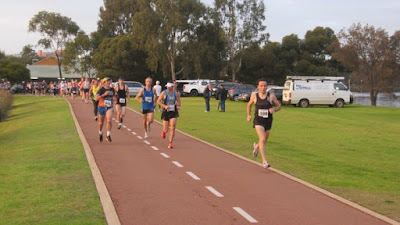 I have trained once with his running group, and am trying to get more organised so I can fit in training with his group, and hopefully spark a training and racing resurgence, as I am way off where I was in october 2010, and Ive lost ground since 6 foot a bit too. Also plan to try and train with trail running group and obviously keep doing my own sessions. So going into the Perth Marathon I had low expectations, and concerns about my ability to last the distance. I also have no Pc with internet at home (unpaid bills shut that down after 6 foot), so internet access very limited. cant blog via my phone or use strands.com Have to go to library or friends. I can use facebook and check email on my phone. I figured the 42km on trails in early April with Darlington group, the Bunbury Half marathon (big thanks to Dave for making that possible) in 1.51, a 16k run with the running group (a week before the marathon) I am now trying to make the 30min drive to, and a 48min 09 10k race at Lake monger the next day (june 12th) in the very fast!!! pair of Nike Lunaracers I have now been given, should be enough to get me to 25-30k ok. Then it would be down to guts and experience in the last 10-15km. I was confident of finishing and hopeful of getting there in about 4.30-5hours. 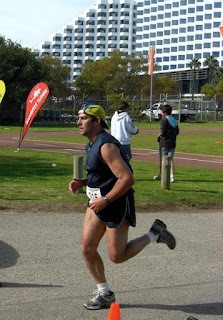 RHR was 39 the day before my 8th Perth marathon (and 14th marathon), so that gave me a lot of confidence. Had some fun at the start trying to run the first 500m in 90 secs, and pretty much did that putting a gap on Todd Ingraham who won in 2.28 (first time Perth has been won in under 2.30 for a few years, well done him, although he is one of the legends of WA running, second only to Ray Boyd in my opinion, and has won in Perth heaps of times), Chris O'Neill and Roberto Busi. 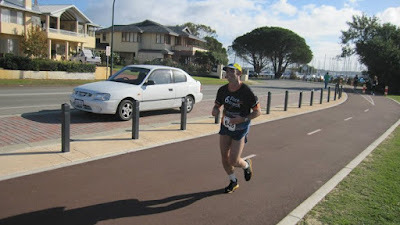 Reckon I got to 500m in roughly about 83 seconds, so about 2.46 per Km pace (1.55 Marathon pace). Photo above is at about 550m to 600m just as I was starting to ease off into a recovery jog for about 500m at about 5.40 per km pace. Then reality kicked in and start fun over, I cruised through 1km in 4.14, and set about trying to settle into a more sustainable pace...I guess I dream of being able to start like that and hold onto my lead, not surrender it, but if that is physically possible for me it requires a massive shift in training,racing and lifestyle from me. I am keen to do that, but my family responsibilities are more important, so have to deal with them first. Racing is not in my top 2 priorities at the end of the day. 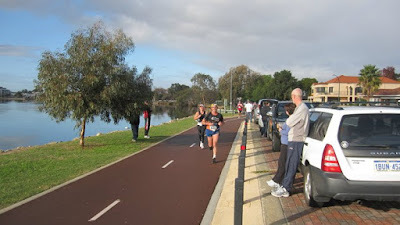 That said I am still hoping to bridge the gap to the sub 3 hour crowd maybe by 2012. Although not hugely confident, that is what I want to aim for. Don't know if it will happen though, but it is on my radar, as it has been for at least a year or so now. Settled down and tried to run about 5-5.30 per K, which I did getting to 10km in about 51minutes. Was consistently hitting 5-5.15's getting to 14km in 73min. Tried hard to stay around this pace, and be conservative with my reasoning being that a 1.53-1.57 Half would be about right and then see what happened rather than bust my gut for something in the 1.45-1.50 zone. Was running with Liz and Chris from about 5k to 15k at least. Took on a gel at 22k, and everything going well. From about 19k to 29k there is a lot of concrete and I always have trouble with rhythm in a large part of this section. This problem repeated, but I still felt very fresh. Blister on foot developed at about 25k. I stopped at 27k to try and readjust my sock to fix this. Wasted a few minutes on this, but it seemed to eliminate the pain. Saw the famous Digger about this time and got passed by Loubou. Caught up with Digger and had a bit of a chat, before carrying on with my attempts to work my way through the field again. Couldnt get much rhythm, and fatigue starting to kick in. Mainly focused on finishing. Crowd support at Raffles awesome. Dennis (massive thanks for these awesome photos too. ), and a bloke playing cranberries song zombie really loud at his house here lifted my spirits as did encouragement from people like Ali from NSRG. Got my coffee Gu and that tasted awesome and gave me a boost. Then got determined to attack again on one of my favourite parts from 31km to 36km Raffles to Narrows bridge. Strong crosswinds and some rain, but I was holding onto about 5.45-6.15 per K, and passing a few people including the guy in a superman costume. Hurting but feeling pretty good, but couldnt get much faster than 6min per K. Lost rhythm again around mends st but got my pepsi at 39k coode st, and kicked home a bit. Did a Leighton Hewitt C'mon and got to 40k in 4.00.24. Was aiming to be home in under 4.20, as a sub 4 chance had evaporated by now, but as I got close to finish I could see sub 4.13 was very possible. At the finish some young bloke tried to sprint past, so i through my pepsi bottle on the ground put the afterburners on and hammered the last 25m in about 3 seconds, to pip him. I dont like getting sprinted off at the end by anyone. Congrats on your 8th Perth Jonathon. Must say I'm impressed you can take off at 3 min k pace then cruise a 4:14 first k and still finish the marathon. ONE 4:14 k would do me in! Nice to break 6 minute k pace too. Hope you can get things turned around a bit with the finances. 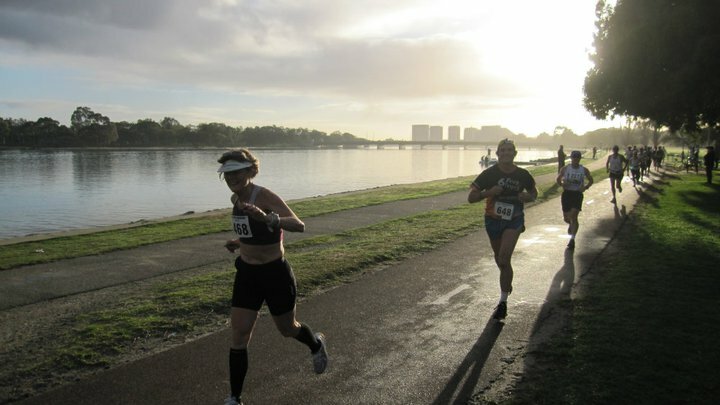 In any case, keep on enjoying your running and racing.